An aurora borealis (aurora australis in the Southern Hemisphere) is precipitated by explosions on the surface of the Sun, sometimes starting as solar flares, said Robert Nemiroff, an astrophysicist at Michigan Technological University and coauthor of NASA’s Astronomy Picture of the Day website. These flares release a burst of charged particles, or plasma, into the Solar System. When they come our way, they whack into the Earth’s magnetosphere, which is made up of its own stream of charged particles. That collision causes particles to break free of the magnetosphere and cascade toward the Earth’s magnetic field lines, usually traveling toward the poles. “The aurorae happen when these high-energy particles bap into atoms and molecules in the Earth’s atmosphere, typically oxygen,” Nemiroff said. Light is emitted as part of the reaction. 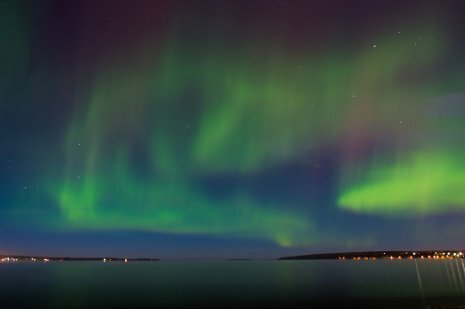 Aurorae can happen anytime, but it’s no surprise they are happening now. “We are nearing the solar maximum, which is when the Sun is at its most active,” he said. Solar maximums come around every 11 years, but no one knows why. “You can have solar flares and aurorae during the solar minimum, but we get more now because the Sun’s magnetic field is tangled up and poking through the surface, releasing plasma,” said Nemiroff.